High capacity due to short transport time and simultaneous inspection of 6/5/4/3/2 Objects depending on size of object. Simple design allows easy change of object holder spacing to enable machine to handle large objects. Absolute secure guidance and holding of the object by very efficient mechanical system. Clear and functional illumination of object adjustable to the operator’s field of vision. The good objects are discharged in a group. Quick change of size parts and easy cleaning. The rotation velocity is infinitely variable. Sturdy and simple construction consciously avoiding all parts that need frequent repair. Discharge chute for customer’s own magazine. 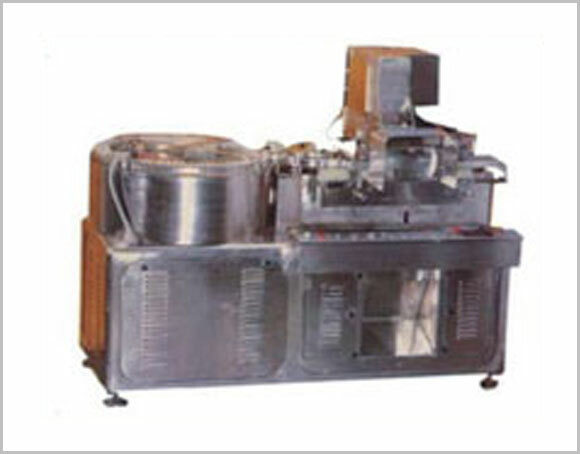 Machine can be in line connected with existing sealing & labeling machine. Digital counter for infeed and ejected vials. Microprocessor based logic controllers for Rejection failsafe alarm.